Cape Town - How much debt is too much? While there is no definite measure, there are ways to determine if you've taken on more than you can handle. If you cannot pay all your household expenses, including your debt repayments, you have a problem. 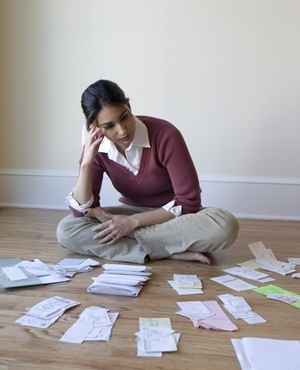 It may be that you have too much debt, but it may also be that you are not spending your available income correctly, explains debt counsellor Renee Marais. "We are all responsible for contributing to the financial purse of the country," says Marais. These deductions are usually part of your employment contract as fixed deductions and are usually categorised as employer's deduction. This is what is used to pay off debt, for an example. If your discretionary income is less than the monthly instalments needed for your monthly debt repayments, ie, if you can only pay some of your creditors and not others, you are in big trouble, says Marais. If you find yourself unable to afford your debt, the first thing you must think about it is how you spend your living expenses and where you can cut down. 1. Buy what you need, not what you want. 2. Get a timer for your geyser. They are well insulated, and one can easily make a blanket with 3 layers of newspaper and tinfoil also if you wish. 3. Don’t buy expensive coffee and other beverages. Take a flask for on-the-go coffee or tea from home. 4. Don’t buy plastic bags from the supermarket, take a cloth bag that can fold up and be reused and washed. 5. Brainstorm on ideas as to how to save on living expenses. She further explains that the credit provider could give you a "payment holiday" for 3 months but this will result in additional interest charged when the debt is refinanced and the instalment after 3 months might be higher. Also, some credit providers will allow for a reduction of the instalment for a period of 6 months. Thereafter there will be a refinancing with again a higher instalment and additional interest. Speak to the credit provider and get the amendment in writing. Have, for example, a 30- or 60-day savings account - which incidentally has tax benefits and a little more interest than an ordinary savings account. The down side is that you must give the bank notice before you can access the funds.